If you own a home…or you have assets worth at least $100,000…you owe it to yourself – and your family – to get the facts on proper estate planning. If you think you’re protected with a simple Will…think again…A Will goes through probate, which means your family may not be able to take possession of your estate for many months, or even years! Proper estate planning avoids the pitfalls of probate and ensures that your estate actually gets to those individuals or charities you wish. A living trust can eliminate the costs and time involved in a probate and will protect your estate if you become incapacitated by avoiding a conservatorship. This means your estate will be managed as you see fit, not as a court-appointed conservator sees fit. 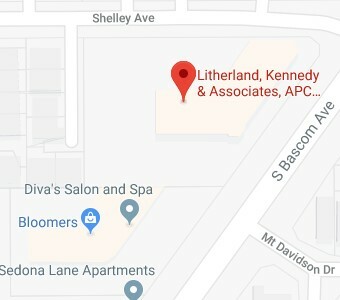 To find out more about the benefits of proper estate planning, attend this free Living Trust Seminar at: Litherland, Kennedy & Associates, 3425 S. Bascom Avenue, Suite 240, Campbell. Refreshments will be provided. Seating is limited at this location and reservations are required. This seminar is FULL. To be added to a wait-list in the event of cancellations, please call (408) 356-9200 or (831) 476-2400.